You just need to select a file from some directory using the menu similar to Midnight Commander, and MOC will start playing all files in this directory beginning from the chosen file. There is no need to create play lists like in other players. 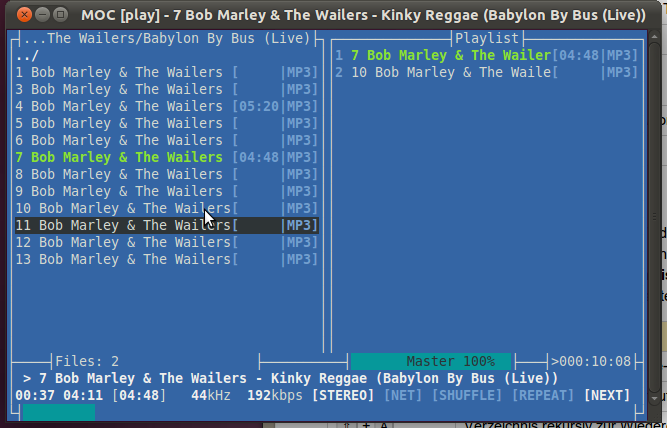 If you want to combine some files from one or few directories on one play list, you can do this. The play list will be remembered between runs or you can save it as an m3u file to load it whenever you want. Need the console where MOC is running for more important things? Need to close the X terminal emulator? You don't have to stop playing -- just press q and the interface will be detached leaving the server running. You can attach it later, or you can attach one interface in the console, and another in the X terminal emulator, no need to switch just to play another file. MOC plays smoothly, regardless of system or I/O load because it uses the output buffer in a separate thread. It doesn't cause gaps between files, because the next file to be played is precached while playing the current file. Internet stream (Icecast, Shoutcast) are supported. Supported file formats are: mp3, Ogg Vorbis, FLAC, Musepack, Speex, WAVE, AIFF, AU (and other less popular formats supported by libsndfile. New formats support is under development. Searching the menu (the play list or a directory) like M-s in Midnight Commander. The way MOC creates titles from tags is configurable. Optional character set conversion for file tags using iconv(). OSS, JACK, and ALSA output. To start type mocp in terminal and it doesn’t use pulseaudio meanwhile uses very low memory & cpu.